Beautifully Hand woven Navy Blue colored Maheshwari Cotton Silk Saree delivers a classy look. 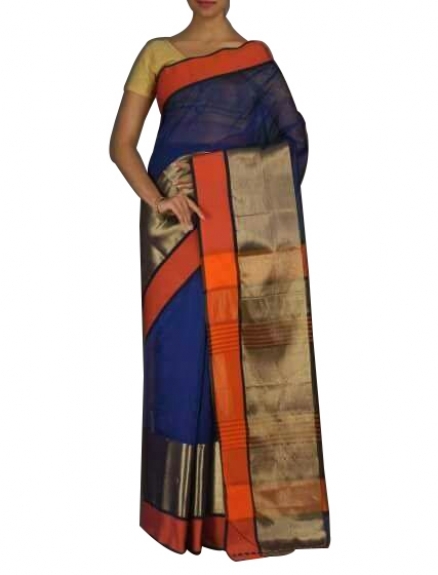 This Maheshwari Cotton Silk Saree has a Navy Blue colored body. Border of this saree has a beautiful combination of thin Orange and wide Golden colored stripes. Golden colored pallu has thin stripes on it. Soft, Smooth, Airy and Light weight Maheshwari Cotton Silk Saree is easy to drape. Dry clean this saree for first wash. Subsequently hand wash this saree and dry in shade. The orgin of Maheswari sarees happend in the 18th century, when Queen Ahilyabai Holkar ordered various craftsmen from Malwa and Surat to design a special saree, which later came to be known as Maheswari sarees. This hand woven Maheswari Cotton Silk saree has a beautiful combination of Navy Blue, Red and Gold colors. This saree is a perfect fit for all the occasions in your life.